This type of app is similar to the Gooce Plus plugin for Google Plus profiles where you can view both your facebook and twitter accounts under one roof. 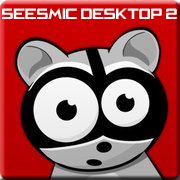 Seesmic Desktop 2 has been well designed which would automatically attract the user to use it frequently. With notifications popping up every minute to the right side of your monitor, you can simply view all the updates that are being posted by your friends. You might be worried about the frequent popup notifications annoying you every second. There is nothing to worry as this app gives you the option to either switch off all the notifications or select a specific time interval for the updates to be shown. For example, for your facebook account, you can set your update frequency for 2 minutes to 30 minutes. If you have both Twitter and Facebook linked with this app, it allows you to directly post your status for both your twitter and facebook profiles ! This is the best thing as you do not have to go all the way to post it one by one. More over, you can even upload or link images and then post it to both the profiles. Simply two in one ! You do of course have the option of choosing on where to post your updates. Additionaly, you can also view the profiles of your friends in facebook and the followers in twitter ! The sidebar at the left gives you range of viewing options. You can have a separate tab for your Home where it jots down all the updates from your linked accounts. 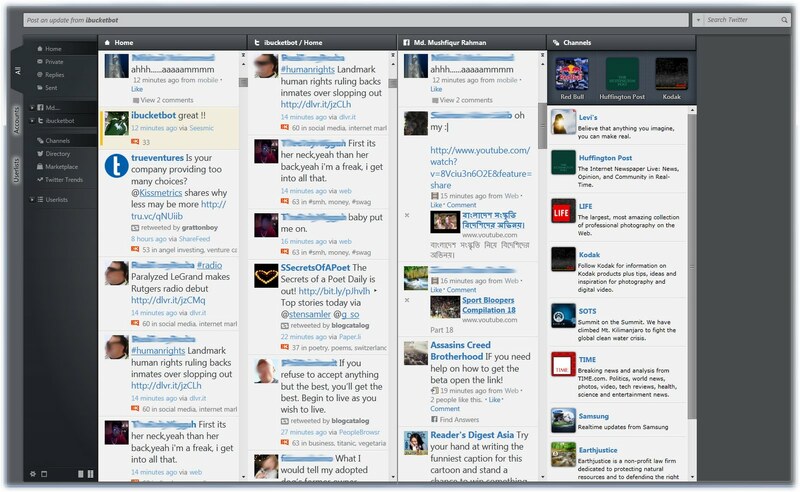 You can view your private messages and replies for twitter seperately in other tabbed windows (1st picture). For every status update in facebook, you are also given the option to comment and like the posts. The options tab gives you the power to control what you want to see. 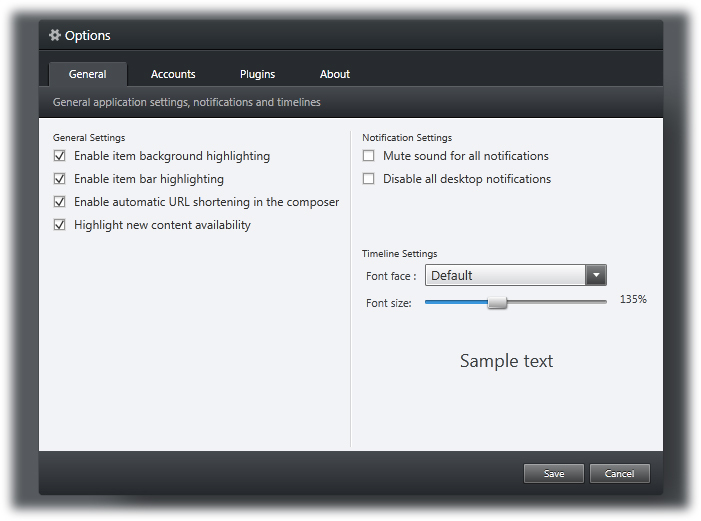 Disable your notifications, mute the sound, change your fonts, add more plugins to make this app more interesting and more ! The popup notifications is an interesting feature. In the case of twitter, for every tweet, you can directly reply, retweet or send a message. For Facebook updates, you can just see the updates as you can comment or ‘like’ when the facebook tab is opened. Summing up, a great windows app that would simply save your time and energy and of course, give you an awesome experience. The pop up notification gives you the opportunity to decide if you want to comment, like or tweet the post! There are lot of awesome features but it lacks the option of viewing the pictures in both Facebook and Twitter. This app works great with Twitter as it gives you more options than the other social media profiles. Before downloading you have to have Microsoft Silverlight installed before and if you do not have it, it gives you the option to download it first and then download Seesmic Desktop 2. The site shows Seesmic for the Web and for the Desktop. If want to experience it in the Web, then you do not need any download (duH!). Awesome post! This really helps. Wonderful information brother… I'd like to congratulations and say thanks for providing info on Windows Apps. Thanks for the share! This sounds like a great app, I know plenty of people that would be interested in this, lol. It is ! Your welcome zahin! I am downloading it now. Can I view photo albums in Facebook from this apps ? I am afraid you can’t ! You can just view the profile pictures ! I hope they would fix this in the next update!